The XML Editor is the primary editor. It displays when you open a content file from the Content Explorer, and provides access to the underlying XML structure of documents in a comfortable visual authoring environment. 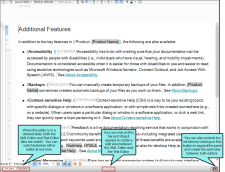 This editor is used to enter, modify, and format the content for topics that users see in the output. 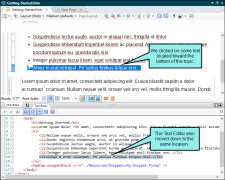 Not only is this editor used for topics, but it is also used for working with master pages and snippets. Although this editor lets you produce XML files, you do not need to know anything about XML to use it. Navigate to a topic, master page, or snippet. Double-click the file that you want to open. There are multiple layout modes that you can use when editing content files: Web Layout, Web Layout (tablet), Web Layout (mobile), and Print Layout. These are necessary because Flare lets you create many different kinds of outputs from the same content, and online output is usually meant to look much different than print-based output. 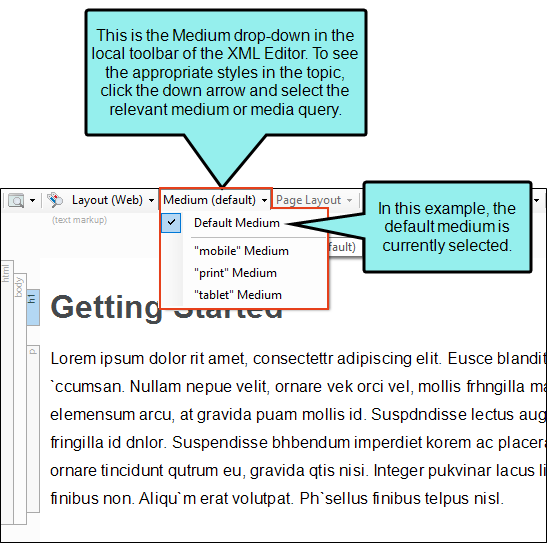 The layout modes are designed to work alongside mediums and media queries, which you can also select in the local toolbar of the XML Editor. If your content doesn't look the way you expect it to in the XML Editor, it might have something to do with these settings. 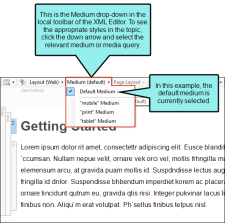 For more about these features, see About Layout Modes, Selecting Mediums and Media Queries, and Selecting a Page Layout to View Content in the XML Editor. You don't need to know XHTML or HTML to work in Flare. The XML Editor displays content just as you might expect to see it in an editor such as Microsoft Word. However, you can get behind the display to work in the actual code if you want. This is done in the Text Editor (or in another editor that supports XML). 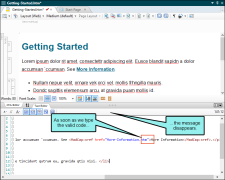 The XML Editor and the Text Editor are closely synchronized with each other. They can be shown in a single window with options for viewing both at the same time and configuring their appearance. You can view the XML Editor and Text Editor in a docked state, where only one editor can be seen at a time, but you can easily access the other editor by clicking on a tab. Alternatively, you can undock the window and view both the XML Editor and Text Editor in a split view. Buttons allow you to switch between a horizontal split view and a vertical split view. Note: You can also switch between the XML Editor and Text Editor by pressing CTRL+` (grave accent) on your keyboard. 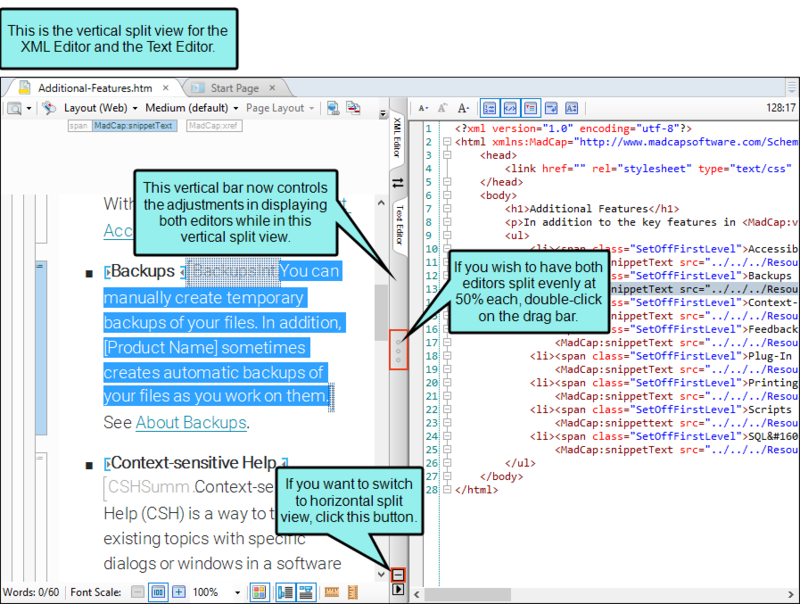 Not only does split view allow you to see the XML Editor and Text Editor jointly in different ways, but there are also special features with split view. Highlighting text in one editor automatically highlights the related text in the other editor. Clicking in one editor causes the other editor to jump to the same position. Note: If you highlight areas in the XML Editor that matches non-consecutive sections of XML, no highlight is shown in the Text Editor. For example, in the XML Editor, you can highlight different parts of a table, but because of the order in which table markup is written in XHTML, it cannot be similarly highlighted in the Text Editor. Code Validation If you type characters that result in invalid XML, the Text Editor displays an error with information as to why the error exists. In addition, the following rules are in effect, depending on whether the editors are docked or undocked. If the editors are not docked (i.e., you can see the XML Editor), updates (i.e., highlights, edits) stop going from the code to the XML Editor. 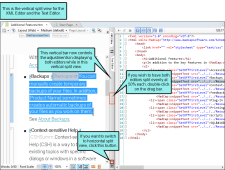 If you make an edit in the XML Editor while erroneous XML is in the Text Editor, the changes in the XML Editor take precedence over any edits in the Text Editor. 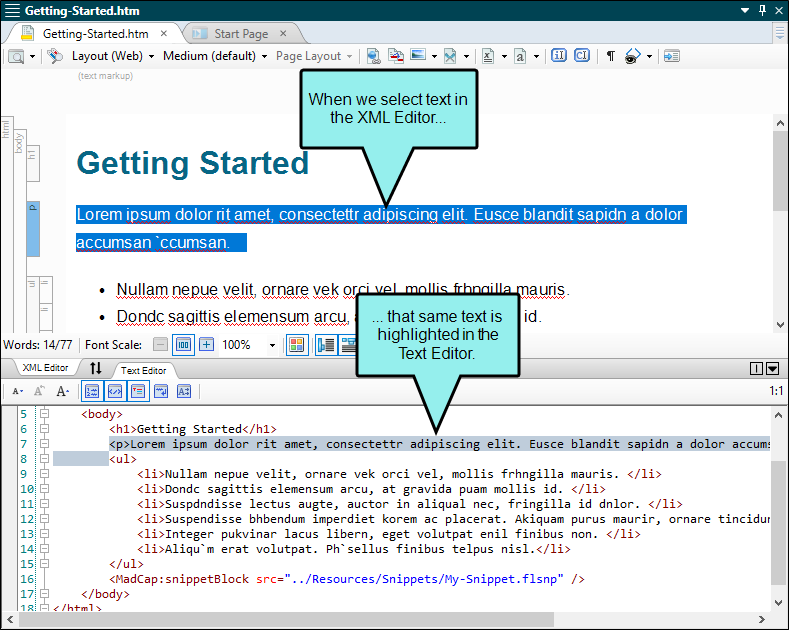 If the editors are docked (i.e., you cannot see the XML Editor), you will be unable to start a split view or click the XML Editor tab until the error is resolved. 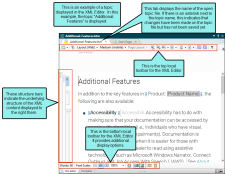 Invalid Edits Outside of Flare If the document being viewed is edited outside of Flare with invalid XML and saved, Flare will prompt you to open the file as text. 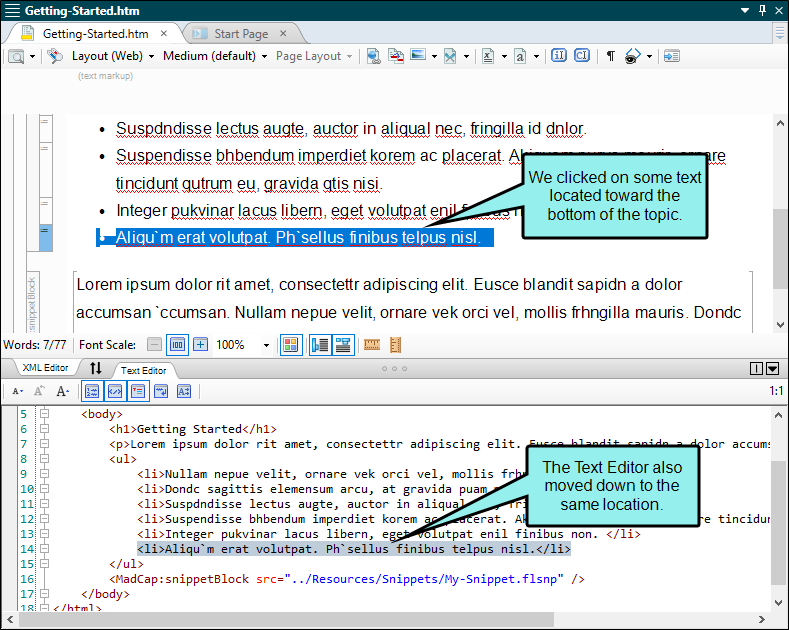 If you select "Yes", the editors remain open in split view, but the Text Editor becomes the main editor and the XML Editor cannot be shown until the invalid code is fixed. Although the code for Flare is HTML, remember that this is an XML editor that follows the W3C XHTML Schema specification. Therefore, if you want or need to enter entities for characters and symbols (e.g., via a third-party tool), you need to use the XHTML entity number. After you add a valid entity into the Text Editor, it is converted to the actual character or symbol after you switch to the XML Editor view and then back to the Text Editor view. You can find a list of valid entity numbers for characters and symbols on the W3C website. See http://www.w3.org/TR/html401/sgml/entities.html. Do not enter &ndash; (because it is not valid XML). 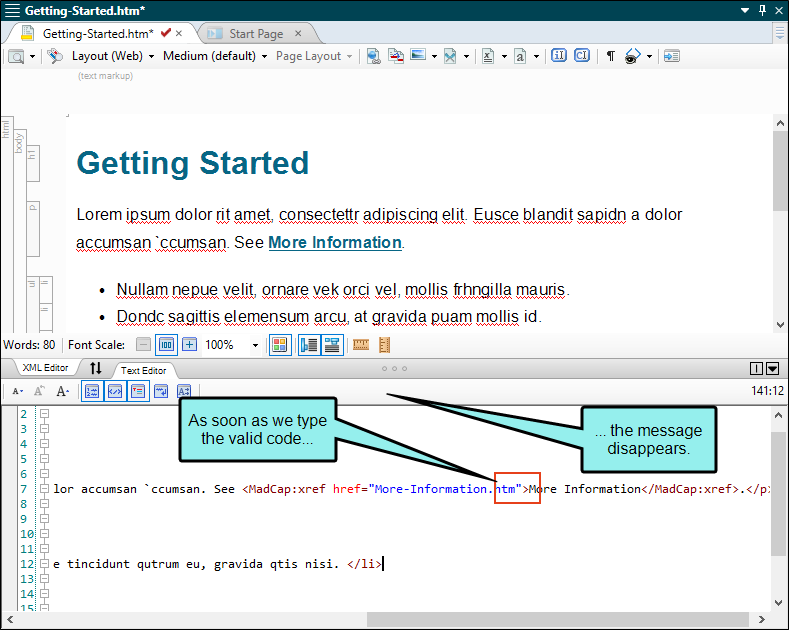 In addition to typing content, there are dozens of things you can do in the XML Editor. Following are some of the primary tasks that you can perform. Bookmarks (Insert/Edit) Read more… A bookmark is a marker, or flag, that lets you create hyperlinks to specific locations within topics (rather than to another topic file in general). You can insert a bookmark at a specific location in your topic (e.g., at a subheading) and then insert a hyperlink that "connects" to that bookmark. This is a useful feature, for example, if you have a somewhat lengthy topic and want the user to be able to locate a specific place in the topic quickly. See Inserting Bookmarks. Characters and Symbols (Insert) Read more… You can insert special characters or symbols into content. This can be done by using the Character dialog, by inserting a quick character that you have specified, by selecting a favorite character, or by selecting a recent character. See Inserting Characters and Symbols. Condition Tags (Apply) Read more… A condition is something that you can apply to different areas of your content so that some information displays in some of your outputs but not in others. See Applying Conditions to Content. Cross-References (Insert/Edit) Read more… A cross-reference is a dynamic navigation link that lets you connect one topic to another (or a bookmark within a topic). This is somewhat similar to a text hyperlink. However, cross-references differ from hyperlinks in a few ways. (1) They are based on format commands that help you keep the look of links consistent. (2) They are especially useful for print output because they let you automatically refer to specific areas and/or page numbers in the output. (3) Both the source and destination files must be part of the same target output within the same project. See Inserting Cross-References. Drop-Down Text (Insert/Edit) Read more… Drop-down text is a feature that lets users click a hotspot to expand and collapse specified content below it. Let's say you have a topic that seems to be getting quite lengthy. So you decide to condense the portion of the topic that contains step-by-step procedures. When users open the topic in the output, they will see a link (also called a "drop-down hotspot"). This hotspot is the first paragraph (or a section of the first paragraph) that you condensed. It might be something like "How to create a project." When users click that hotspot, the hidden content (e.g., the actual steps to create the project) is displayed below the hotspot. When users click the hotspot again, the content becomes hidden once more. See Inserting Drop-Down Text . Equations (Insert/Edit) Read more… From any location in a topic or snippet you can insert an equation. Although an equation may be composed of many different parts, in the XML Editor it renders as a single block of content. In that way, it behaves much like an image. See Inserting Equations. Expanding Text (Insert/Edit) Read more… Expanding text is a feature that lets users click a hotspot to expand and collapse content that appears after it in the same paragraph or other block element. Let's say you have a bulleted list in a topic. After each bullet is a feature of the software program that you are explaining. You have given a detailed description of each feature, and now the topic seems to be getting quite lengthy. So you decide to condense each bulleted item so that users initially see only the name of the feature, which appears as a link (also called an "expanding text hotspot"). When users click that hotspot, the hidden content (i.e., the rest of the paragraph) "expands" and is displayed after the hotspot. When users click the hotspot again, the content becomes hidden once more. See Inserting Expanding Text. 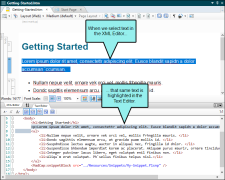 Formatting—Local (Apply) Read more… When you edit the content of a topic, you are working in the XML Editor. Local formatting is a way to change the look and feel of content directly so that the changes are applied only to that specific content (as opposed to applying the changes throughout your project via the use of styles). However, using styles is recommended instead of local formatting when possible. See Local Formatting. Hyperlinks (Insert/Edit) Read more… A text hyperlink is one of the most basic forms of a navigation link. It is simply a hyperlink applied to text. When an end user clicks the hyperlink in the output, the location specified in the hyperlink opens. The location can be another topic in the project (including a bookmark within that topic), a topic in an imported HTML Help file, or a file outside of the project (such as a website on the Internet). See Inserting Text Hyperlinks. Images (Insert/Edit) Read more… You can insert images into content files (e.g., topics, snippets). Flare supports the following types of raster and vector image files: BMP, EMF, EPS, EXPS, GIF, HDP, JPG, JPEG, PDF, PNG, PS, SVG, SWF, TIF, TIFF, WDP, WMF, XAML, XPS. See Inserting Images. Index Keywords (Insert/Edit) Read more… Unlike some features in Flare, there is no independent index file in your project that becomes the index in your output. Instead, the index is automatically generated when you build output, based on index keywords that you insert into content files in your project. See Inserting Index Keywords. 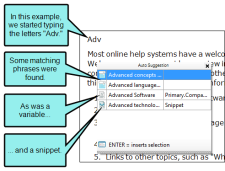 Keyword Links (Insert/Edit) Read more… A keyword link is a Help control that lets users open topics related to the current topic based on index keywords that they share. See Inserting Keyword Links. Locate in Content Explorer Read more… If you have a content file open in the XML Editor and want to quickly find where it is stored in the Content Explorer, you can right-click in the file and select Locate in Explorer. Flare opens the Content Explorer, expanding folders to show where the file is located. See Locating Files in the Content Explorer. Locate in TOC Read more… If you have a topic open in the XML Editor and want to quickly find where it is linked in a table of contents, you can right-click in the file and select Locate in TOC. If the topic is located in more than one TOC, a dialog opens, listing all of those TOCs. Select the TOC you want to look in and click Open. See Locating Topics in TOCs. Micro Content (Create) Read more… Micro content is what it sounds like—short, concise information that stands alone and is easily consumable. In Flare, it begins with the creation of a collection of brief phrases and corresponding responses, such as questions and answers. After generating HTML5 output, these phrase/response combinations can be used in different ways as users interact with your output. Among other benefits, it can greatly improve the user experience when people search in your HTML5 output. See About Micro Content and Creating Micro Content. Multimedia (Insert/Edit) Read more… Not only can you explain concepts and tasks to users in your project, but you can also show and tell them through the use of multimedia (video and audio). You can insert links to YouTube and Vimeo movies; files such as Flash, Windows Media, and Quicktime; MadCap Mimic video files; and 3D models. See About Multimedia. 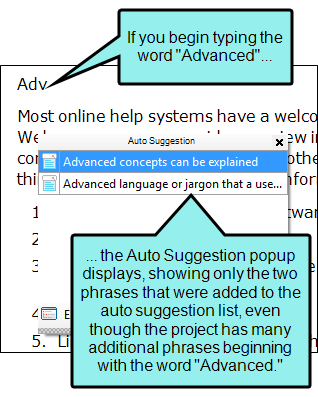 Popups (Insert/Edit) Read more… A text popup is a link that opens a popup box containing basic text that you provide. A topic popup is a text hyperlink that opens a topic or external file (such as a website) in a popup box. 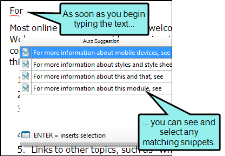 See Inserting Text Popups and Inserting Topic Popups. Preview Read more… You can quickly see how a topic (as well as a snippet or master page) will look in the final output by previewing it. The Preview window pane is dynamic, allowing you to keep the preview open while you work and see changes as you make them in the XML Editor. See Previewing Topics. Proxies (Insert) Read more… A proxy acts as a placeholder for auto-generated content or content that you have created elsewhere. When you build output, the content takes the place of that proxy. Proxies can be added to regular topics, as well as to master pages. The difference is that a proxy added to a topic will display that information in the output only once (wherever the topic occurs), but if a proxy is added to a master page, the content will show up everywhere that the master page has been applied. Proxies are quite often used for print-based outputs, especially to create navigation-like elements, such as TOCs, indexes, and glossaries. However, proxies can be used in online output as well. They can be especially useful if you are creating HTML5 Top Navigation output, where the traditional tripane format is replaced by a more modern design that relies heavily on proxies. See About Proxies. QR Codes (Insert/Edit) Read more… You can insert a quick response (QR) code into a content file (e.g., topic, snippet) using the XML Editor. A QR code is a type of barcode that can be read by devices such as smart phones. The data encoded in the QR code can be text, a website URL, an email address, contact information, or SMS (Short Message Service, which is used for sending text messages). Basically, QR codes are a way to bridge the gap between a static print document and searchable, more detailed online information at your fingertips See Inserting QR Codes. Related Topics Links (Insert/Edit) Read more… A related topics link is a Help control that provides users with list of links to topics that you've specified as being related to the current topic. This is similar to a concept link. You might use a related topics link if you are applying it to a topic that you want to associate with specific topics but you do not plan to reuse the same link in other topics. See Inserting Related Topics Links. Responsive Layouts (Create/Edit) Read more… Styles and media queries can be used to make your content responsive in HTML5 output. This lets you present information—both its substance and structure—differently depending on the size of the screen or device. Flare provides a Responsive Layout window pane that helps you create this kind of content more easily. You also have the option of using third-party solutions (most notably the Zurb Foundation grid system) by adding the appropriate styles in your stylesheets and topics. See Creating Responsive Layouts. See Also (Concept) Links (Insert/Edit) Read more… A concept link is a Help control that lets users open topics that you've determined are related to the current topic. It is similar to the related topics link. However, whereas you associate a related topics link with specific individual topics (usually for a one-time use), you associate a concept link with a group of topics (to be reused in different topics). One great benefit of this type of link is that, if you later want to add or delete topics from the group, you only need to do so in one place and the changes are applied to every topic containing that concept link. See Inserting Concept Links. Slideshows (Insert/Edit) Read more… You can add a slideshow as an alternative way to display content, using navigation controls to move from slide to slide to view different content. Most kinds of content can be placed into a slideshow, including snippets, text, tables, and more. See Inserting and Navigating in Slideshows. Snippets (Create/Insert/Edit) Read more… A snippet is a file that is sort of like a miniature topic. You can insert and format text, tables, images, and whatever else can be included in a normal topic. A snippet can be inserted into one or more topics throughout your project, thus allowing you to reuse content that is maintained in one place. You can even insert them into other snippets, creating nested snippets. We’re not usually talking about single words or phrases; that’s what variables are for. 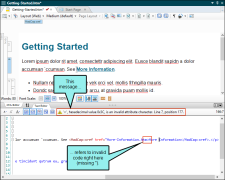 See Creating New Snippets from Existing Content and Inserting Snippets. Styles (Apply) Read more… If you are using styles in your project, you can change the look of content simply by applying styles to it. See Applying Styles to Content. Tables (Insert/Edit) Read more… A table in Flare is much like it is in any word processing program, such as Microsoft Word, or in a printed textbook. It is a group of intersecting columns and rows that you can add to a topic for various purposes, such as comparing different elements. See Inserting Tables. Togglers (Insert/Edit) Read more… A toggler is a feature that lets users click a hotspot to reveal one or more named elements in a topic. A named element (also called the "toggler target") is a chunk of content that can reside anywhere in the topic. When users click the toggler hotspot, the output reveals hidden content elements. When users click the hotspot again, the content is hidden again. See Inserting Togglers. Variables (Insert) Read more… A variable is a brief, non-formatted piece of content that can be edited in one place but used in many places throughout your project. They're especially good for text that might change frequently, such as version numbers and dates. Variables are stored in variable sets, which can hold multiple variables. Depending on the template you select when creating a project, Flare may provide you with an initial variable set, but you can add as many additional variable sets and variables as you like. There are different kinds of variables: (1) basic ones that you create, (2) custom date/time variables that you create, (3) system variables (e.g., date and time; titles; page count; Chapter, Section, and Volume numbers), (4) Heading variables, and (5) Running Head variables. Some of these are especially useful for page headers and footers in print-based output. See Inserting Variables. When you are working in the XML Editor, you can use the F8 shortcut to repeat your last action. This feature uses the same controller that is used when you create macros in Flare. Therefore, only actions that are supported by the macro controller are supported for the repeat shortcut. See About Shortcuts and About Macros. Let’s say you are in a topic where you need to apply a span style class to several words to change the text to blue. You highlight the first word and apply that style class using the Styles window pane. But instead of following those same steps to format all the other words, you use the repeat shortcut. You highlight the next word that needs to be blue and press F8. The blue span style class is applied to that word. You highlight the next word and press F8 again. Once more, the blue span style class is applied. You continue doing this until all the appropriate words have that style class applied. Next, you realize that you need to turn several paragraphs in the topic into drop-downs. So you select the first group of relevant paragraphs and select Insert > Drop-Town Text to create a drop-down effect. You highlight the next group of relevant paragraphs, but instead of using the option in the Insert ribbon again, you press F8. The drop-down effect is applied to those paragraphs. You continue to use the F8 shortcut until all the necessary content in the topic is turned into drop-downs. Tip: If you prefer to use a shortcut other than F8 for this feature, you can open the Options dialog (File > Options), select the Keyboard Shortcuts tab, choose XML Editor in the top field, and assign the Repeat action to a different key. See Changing Hot Keys. Note: Although you can only repeat an action if that action is supported by the macro controller, you do not need to have assigned a macro to your action in order to repeat it. This allows you to repeat occasional actions without having to spend time recording a macro. This button lets you preview the topic, snippet, or master page. It also lets you see how the topic will look with condition tags associated with it or with specific target settings applied to it. If you click the face of the button, the preview is shown based on the format specified in the primary target. If you click the down arrow, you can select any of the targets in your project from a menu. The preview is then displayed using the output format specified in that target. In addition, the preview updates as you save changes in your file; when you open a new content file (i.e., topic, snippet, master page); when you change the File, Target, or Conditional Expression fields; and when you click the refresh button .This ensures you are always seeing the most current content in the Preview window pane. For more information see Previewing Topics. Note: The topic preview feature is not available for Microsoft Word formats. Opens the Conditional Text dialog, which lets you associate condition tags with a file while you edit it. This is similar to the feature that you can use to preview a document with certain conditions set. 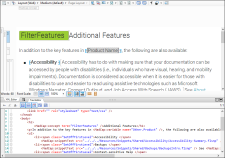 The difference is that this associates the conditions to the document as you edit it in the XML Editor. See Associating Condition Tags to a File While Editing. 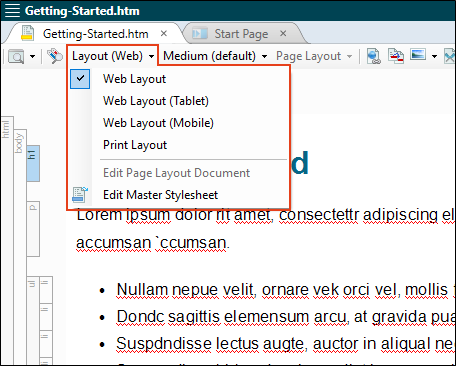 Flare provides multiple layout modes when working in the XML Editor: Web Layout, Web Layout (Tablet), Web Layout (Mobile), and Print Layout. This lets you see your content in the format that you are most likely concerned about at the moment. See About Layout Modes. The default and print mediums are tied to the Web Layout and Print Layout modes, respectively. The tablet and mobile media queries are tied to the Web Layout (Tablet) and Web Layout (Mobile) modes, respectively. You are using the Web Layout mode, so the XML Editor displays the styles from the default medium. But if you switch to Print Layout mode, the XML Editor automatically displays the styles from the print medium. And if you choose the Web Layout (mobile) mode, the XML Editor adjusts to show the topic as if it were displayed on a mobile device. The key is to select the layout first. If you select the medium or media query, the layout will not automatically change as well. Web Layout This is useful for seeing how the topic will look online, usually on a laptop or a large monitor. Web Layout (Tablet) This is useful for seeing how the topic will look on a tablet device. Web Layout (Mobile) This is useful for seeing how the topic will look on a mobile device. Print Layout This lets you see how the pages will look with a page layout applied to it. In other words, it lets you see how the page will look when you generate print-based output. This means that you will be able to view the actual page size and orientation, as well as the margins and any header or footer content. Note: Although the Print Layout mode is a WYSIWYG (What You See Is What You Get) environment, you also need to consider any condition tags when you are viewing pages in this mode. For example, let's say you have applied a condition tag to an entire paragraph on a page. 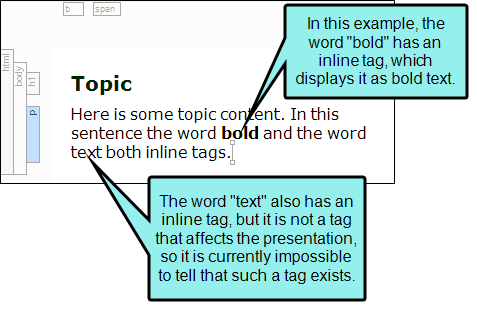 When you are viewing the topic in the XML Editor, you will see this paragraph, but if you generate a target where you have elected to exclude that condition tag, the paragraph will not be displayed in the output, and the other paragraphs will shift to compensate for its absence. Therefore, what you see in the Print Layout mode is what you get, except possibly for certain conditions that may be present on a page. You can get an even more accurate look at how a topic will look in the output by associating conditions with it while you are editing. 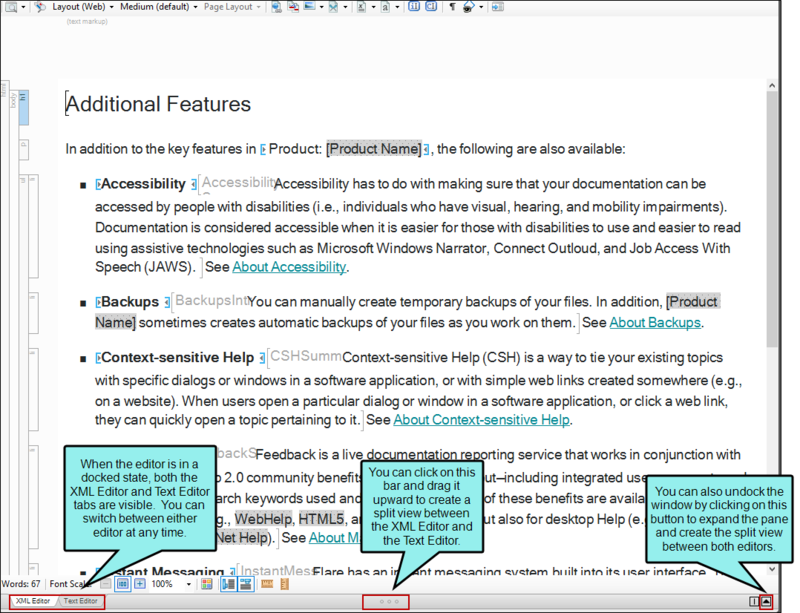 This is similar to the feature that you can use to preview a document with certain conditions set. 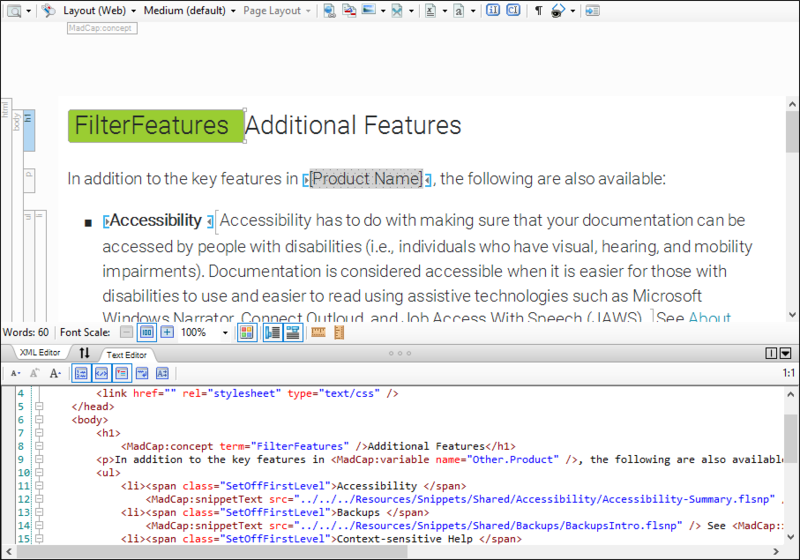 The difference is that this associates the conditions to the document as you edit it in the XML Editor. See Associating Condition Tags to a File While Editing. 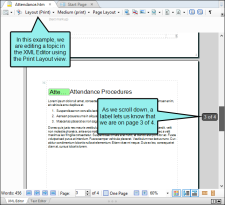 Edit Page Layout Document This opens the page layout associated with the topic so that you can edit it in the Page Layout Editor. See Adding Pages. Edit Master Stylesheet This opens the stylesheet associated with the topic so that you can edit it in the Stylesheet Editor. See Editing Styles in a Regular Stylesheet. Note: This option is available only if you have applied a master stylesheet to the project or target. Clicking the down arrow on this button lets you select a medium or media query so that you can view the topic with a specific set of styles. This drop-down field is simply intended to show you how particular styles make a topic look. By using this feature, you are not telling Flare to use that medium in the output for that topic. The way to do that is to associate the medium with a target. For more information, see About Mediums and Media Queries and Selecting Mediums and Media Queries. 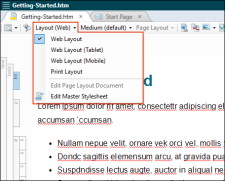 If you are viewing content using the Print Layout in the XML Editor, you can use another drop-down in the local toolbar to choose a specific page layout. 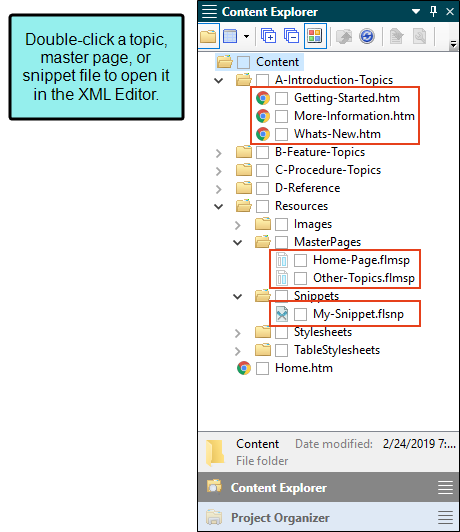 Not only can you select a certain page layout to display a topic in the XML Editor, but you can also choose a specific page type within that layout. This can be especially useful when you know for certain that a particular topic will display on the first page of a chapter, a left page, a right page, etc. The reason Flare does not automatically show a topic in the appropriate page type is because it won't assign page types to content until you generate the output. 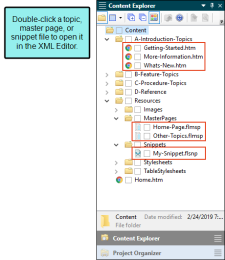 However, sometimes you may know in advance which page type will be used because of its placement in the outline TOC, so you can choose any page type contained in the layout to display the topic in the XML Editor. 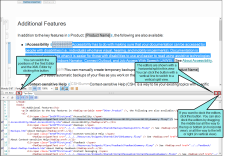 See Selecting a Page Layout to View Content in the XML Editor. 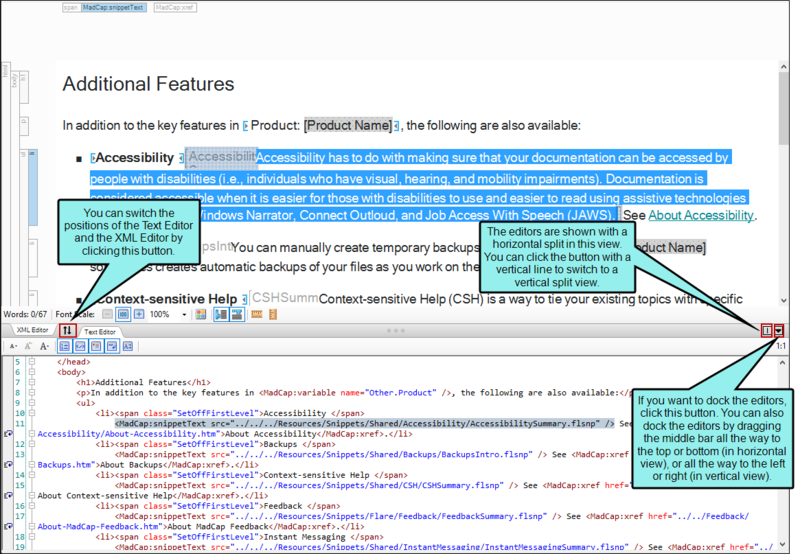 Opens the Insert Hyperlink dialog, which lets you insert a text hyperlink on the selected text in the topic. See Inserting Text Hyperlinks. Opens the Insert Cross-Reference dialog, which lets you insert a cross-reference into the topic at the location of the cursor. See Inserting Cross-References. Activates Index Entry Mode. Use this method to accomplish the same thing as the Index window pane method. The difference is that, with this method, you do not need to move your cursor from the topic or snippet to the Index window pane. You simply click at the spot in the text where you want to insert the keyword and start typing. The words you type are added directly into the Index window pane. This is a good method to use if you plan to do a lot of indexing all at once, without performing any other tasks in the topic or snippet. See Inserting Index Keywords. Activates Concept Entry Mode. Use this method to accomplish the same thing as the Concept window pane method. The difference is that, with this method, you do not need to move your cursor from the topic to the Concept window pane. You simply click at the spot in the text where you want to insert the keyword and start typing. The words you type are added directly into the Concept window pane. This is a good method to use if you plan to create concepts in a lot of topics all at once, without performing any other tasks in the topic. See Inserting Concepts. If you click the face of this button, all of the content changes, showing the XML tags surrounding the content. If you click the down arrow, you can select the following options. Show Caret Tag Neighborhood Read more… Turns this feature on and off (it is off by default). If you click on a line that contains inline tags (e.g., bold font, cross-reference), floating tag bars display above it (this is called the "caret tag neighborhood"). You can click on a bar to open the context menu and take action on the content. 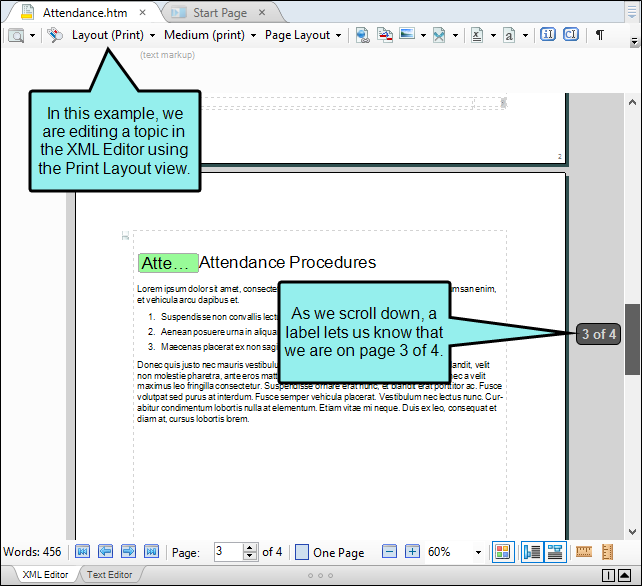 Show Markers Read more… Turns markers on or off in the active topic or other content file. 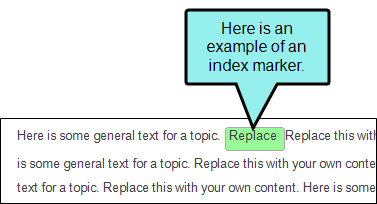 If you have inserted elements such as variables, bookmarks, index keywords, or concepts into topics, markers indicate where they have been added. If the "Markers" option is turned off, you cannot determine whether such elements have been added. Turning the "Markers" on, lets you see exactly what has been inserted into the file. Markers appear in different ways, depending on the type of element inserted. For example, variable markers display as brackets around the variable information, whereas bookmark markers display as shaded flags where the bookmark has been inserted. 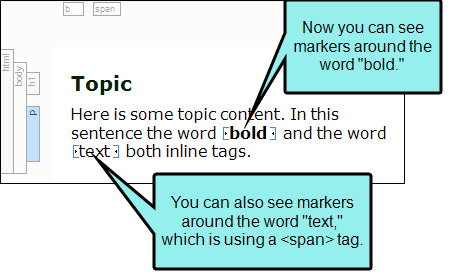 Show Inline Markers Read more… You can show or hide markers for all inline elements in the active topic. You might find this feature useful if you have imported DITA file content. The reason for this is that DITA inline tags are often for semantic purposes, rather than for changing the look of content. By enabling the inline markers feature, it is easy to tell when particular content is using a tag. 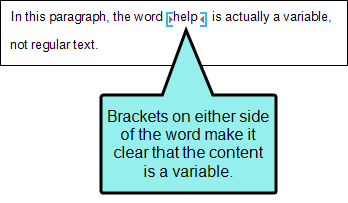 Here is an example where a paragraph contains two pieces of content that use inline tags—one that changes the presentation, and the other that does not. Note: In order to use this feature, you must also make sure that Show Markers is turned on. Show invisible tags Read more… Turns invisible tags (e.g., <title>) on or off in the active topic. This option is enabled only if you have selected "Show tags." Show Comments Read more… Turns comment tags on or off in the active topic. Comment tags are those that you have added to a topic in order include notes behind the scenes (without the comments being seen in the output). Show All Images As Thumbnails Read more… Toggles between showing images in the XML Editor as thumbnails or at full size. This is simply a feature for you as the author, allowing you to scale all images down to 48 pixels high (if the original size is larger than that). This lets you see more content and less of your images as you edit topics. The images are only scaled for your editing purposes; they are not necessarily shown as thumbnails in the output. See Showing Images as Thumbnails While Editing. Show tags in mono-color Read more… Lets you choose whether to display tags in a color or in black. This option is enabled only if you have selected "Show tags." Show tags in mono-font Read more… Lets you choose whether to display all tags in the same font or in the font actually applied to each area. This option is enabled only if you have selected "Show tags." Enable Object Positioning Read more… Turns object positioning on and off. Object positioning can be used with text boxes, images, and other objects that you have inserted into topics. If this option is on, you can easily position the object in different places in the topic (e.g., to the right or left of the frame on a page). See About Positioning Elements. Enable Orphan/Widow Control Read more… Turns widow and orphan control on or off. If this is turned on, you can see the effects in the Print Layout mode in the XML Editor. Widow control determines the minimum number of lines in a paragraph to be left at the top of a page or column. 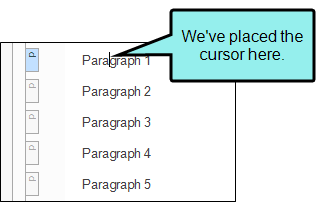 Orphan control determines the minimum number of lines in a paragraph to be left at the bottom of a page or column. The default number of lines for both is 2, but you can adjust this setting. See About Widows and Orphans and Setting Widow and Orphan Control. Show Hidden Elements Read more… Shows content that has been designated as "hidden." In other words, you can have a style where the "display" property value is set to "none." Normally, content to which this style is applied will not be seen. But you can display that content by selecting this option. Conditional Indicators Read more… If you have created and applied condition tags, clicking this button toggles between showing and hiding them. Snippet Conditional Indicators Read more… If you have created and applied snippet condition tags, this command enables or disables a marker that overlays snippets that have snippet conditions applied to them. Note: If you enable this indicator, you will see it on snippets if you have snippet conditions enabled at either the topic level or the snippet level. 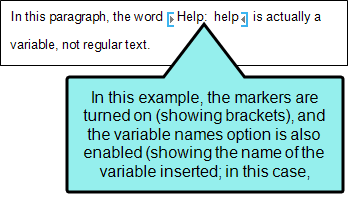 Show Variable Names Read more… Lets you choose whether to see the names of variables in your markers (if you have inserted variables) in the active topic. Highlight Variables Read more… Lets you choose whether to see a gray background behind variable definitions in a topic. Show Bookmark Names Read more… Lets you choose whether to see the names of bookmarks in your markers (if you have inserted bookmarks) in the active topic. Show Named Elements Read more… Lets you choose whether to see the yellow flag icon next to named elements in your markers (if you have inserted named elements) in the active topic. Named elements are used for inserting togglers into topics. Enable/Disable Locks Read more… Locks or unlocks the content designated with the gray background. After content has been locked, it cannot be edited, and annotations cannot be added to it. See Locking Elements. Show Locked Elements Read more… Allows you to show or hide the gray background associated with elements that have been locked or selected to be locked. See Locking Elements. Show Changes Read more… Displays any tracked changes or annotations (notes) that have been attached to any content in the topic. See About Topic Reviews and Collaboration. Marker Width Read more… Lets you adjust the width of markers in the active topic to see more or less of the markers when they are visible. Opens the file in the Internal Text Editor (for review packages only). Displays the number of words in the open file. If you highlight words in the file, this area shows you how many words are selected out of the total count. If a file contains snippets, the words from those snippets are not included in this word count, because those are separate files. Reduces the scale of the font by 10% each time you click the button. Resets the scale of the font to 100%. Increases the scale of the font by 10% each time you click the button. Lets you select a specific percentage to scale the font. Lets you show or hide the colored shading of content to which condition tags have been applied. Let's say your condition tag has blue associated with it and you have applied this tag to a block of content. When you click this button to show the indicator, the block of content becomes shaded with a lighter version of blue. If more than one condition tag is applied to the block of content, the shading appears in a pattern that shows all of the applied condition tag colors. Lets you show or hide the tag block bars. These bars are displayed to the left of the content area. They show the different tags for your chunks of content, as well as the overall tag structure. See About Structure Bars. Lets you show or hide the span bars. These bars are displayed at the top of the content area. They show formatting tags in your content. If you have a block of text that is bold and you click it, you will see a "b" in a bar above. Lets you show or hide a measurement ruler horizontally at the top of the editor or window pane. If you click the ruler after it is opened, you can select to convert the ruler to pixels, points, centimeters, or inches. Lets you show or hide a measurement ruler vertically at the left of the editor or window pane. If you click the ruler after it is opened, you can select to convert the ruler to pixels, points, centimeters, or inches. 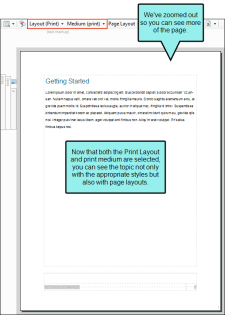 Displays the first page of the topic in Print Layout mode. Displays the previous page of the topic in Print Layout mode. 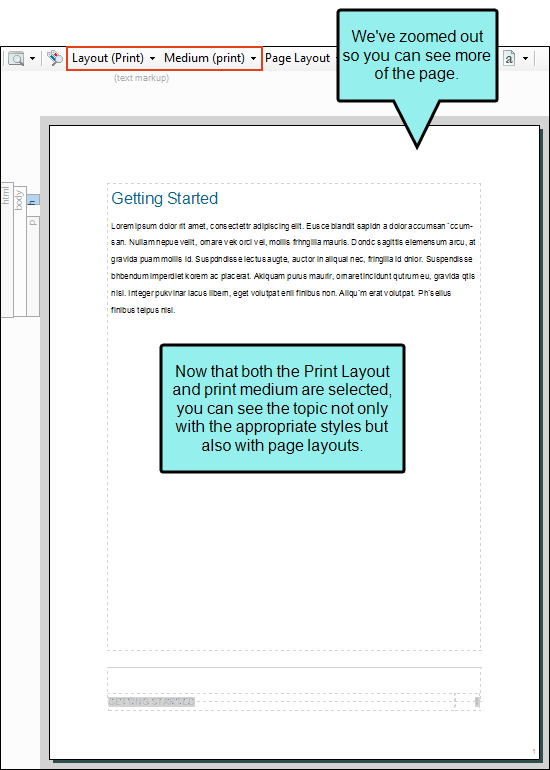 Displays the next page of the topic in Print Layout mode. Displays the last page of the topic in Print Layout mode. Displays the current page of the topic, as well as the total number of pages in the topic. You can enter another number in the field or use the arrow buttons to navigate to a different page. 100% Displays the page at 100% of its actual size. 100% (2 pages) Shows two pages of a topic at a time, displaying each one at 100%. Fit Width Resizes the page so that it displays in proportion to the width of the window pane. One Page Displays only one page at a time. Two Pages Displays two pages at a time. Four Pages Displays three pages at a time. Eight Pages Displays four pages at a time. Note: This option is available only if you are working in Print Layout mode. In this mode, additional pages are automatically created when you add content beyond that which can be held on a single page. These are just what the name implies—bars around the topic content that show the structure. There are two kinds of structure bars—tag and span. Not only do structure bars let you see the tags for content, but you can also perform numerous tasks by using them. Select Options If you right-click on a structure bar, a context menu opens. From the menu, you can select from several options to take action on the content associated with that structure bar. If you want to delete an entire numbered list from a topic, you could right-click the ol structure bar to the left of the content and select Delete from the menu. If you have a table with a table stylesheet applied to it, you can right-click on one of the tr structure bars and select Row Style. From the submenu you can then choose a pattern to overwrite the existing look for that row. Select Content If you left-click on a structure bar, the corresponding content is selected in the editor. You can SHIFT-click on structure bars to extend the current selection to that content block. Let's say you have several paragraphs in a row, and you click halfway into the first paragraph. While holding down the SHIFT key, you click on the paragraph structure bar for the third paragraph. As a result, the content from the point of the cursor to the end of the third paragraph is selected. If you select multiple blocks of content, all of the structure bars involved in that selection are highlighted in blue. If an entire block is included in the selection, the structure bar is shaded in darker blue. If blocks are partially selected, those structure bars are shaded in lighter blue. Move Tag Bars If you left-click on tag bars, you can drag them up or down. If you left-click on table column bars (in the span bar area), you can drag them left or right. In this way, the chunks of topic content can easily be repositioned. In addition, you can click on the borders between column and row bars and drag the mouse to resize individual columns and rows. 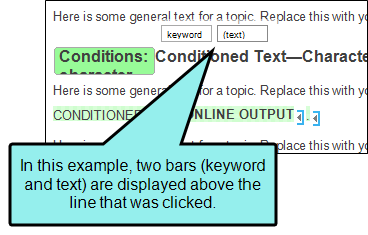 See Moving Paragraphs and Other Content with Structure Bars, Moving Table Columns and Rows, and Resizing Tables. When you edit text, the cursor changes size and shape. Sometimes it contains brackets to the right or left. Sometimes it is larger, and sometimes it is smaller. Each of these appearances serves a different purpose. Following are explanations of these cursors. Cursor signifies the start of an xhtml tag. Cursor signifies you are within an xhtml tag and can edit the contents. Cursor signifies the end of an xhtml tag. Cursor signifies you are between tags. Type to enter text into the parent tag. Cursor size signifies you are in the first of a series of nested tags. Cursor size signifies you are in the second of a series of nested tags. Cursor size signifies you are in the third of a series of nested tags. Some content Courtesy of TechWriteTips. The interface includes a "caret tag neighborhood." If you click on a line that contains inline tags (e.g., bold font, cross-reference), floating tag bars display above it. You can click on a bar to open the context menu and take action on the content. This feature is disabled by default. If you want to turn it on, simply click the down arrow in the editor's Show Tags button and select Show Caret Tag Neighborhood. 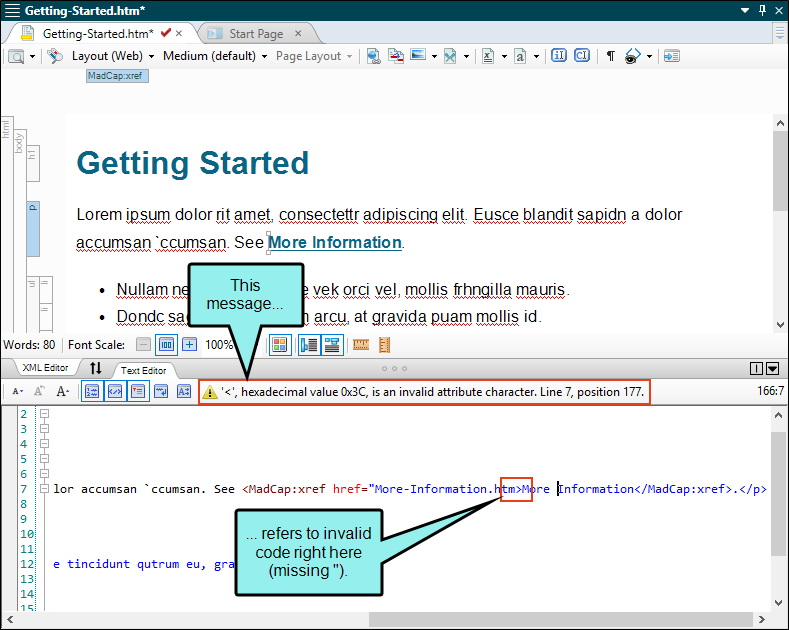 If you are working in a document in the XML Editor and have empty tags at the text level, this will be shown. Note: The display of empty tags is simply designed to help you as you edit content. Even if these tags are shown in the XML Editor when you are working, they will not be shown in your output. This means you can quickly select existing content from the popup so that you do not have to finish typing it. By default, Auto Suggestion is enabled when you first launch Flare. However, you can disable and enable this feature whenever you want. See Enabling and Disabling Auto Suggestion. There are three kinds of content that you can select when using Auto Suggestion: phrases from custom lists, variables, snippets. Phrases From Custom List Rather than automatically basing auto suggestions on all of the text throughout your entire project, you have control over the phrases that you see in the popup when you type. You can add your own words and phrases to an auto suggestions list. That way, instead of being overwhelmed with too many suggestions every time you begin typing text, you only see suggestions that you are likely to use. Variables Flare recognizes when you are typing content that matches existing variables in your project. This includes system variables, such as the date and time, and custom variables that you create. See About Variables. Snippets Flare recognizes when you are typing content that matches existing snippets in your project. This makes it a very fast and convenient way to single-source your content. See About Snippets. Perhaps each person knows to start typing those words in certain places. But what if a snippet already exists with the full content that the writer needs? Without knowing that, a person might spend time typing all of the content, and maybe even create a new snippet for future use. But if Auto Suggestion is enabled, as soon as a person types a certain number of characters, all matching snippets are shown in the Auto Suggestion popup. Therefore, the writer can quickly find and select the appropriate snippet. If you are working on a document in the Print Layout mode, you may see icons in the margins next to text. These icons indicate where a paragraph has been moved to another page or column as a result of a page or column break, or due to widow or orphan control. You can set page breaks, column breaks, orphan control, or widow control either manually on individual paragraphs or you can set them on styles. You can click on any of the icons in the document to open the paragraph properties.See Setting Page and Column Breaks and About Widows and Orphans. Following are the types of icons that you might see in a document. Explicit Page Break This icon displays if you have created a page break before a paragraph. Explicit Page Break by Previous This icon displays if you have created a page break after a paragraph. Explicit Column Break This icon displays if you have created a column break before a paragraph. Explicit Column Break by Previous This icon displays if you have created a column break after a paragraph. Orphan Controlled This icon displays if a paragraph has been adjusted due to orphan control. Widow Controlled This icon displays if a paragraph has been adjusted due to widow control. 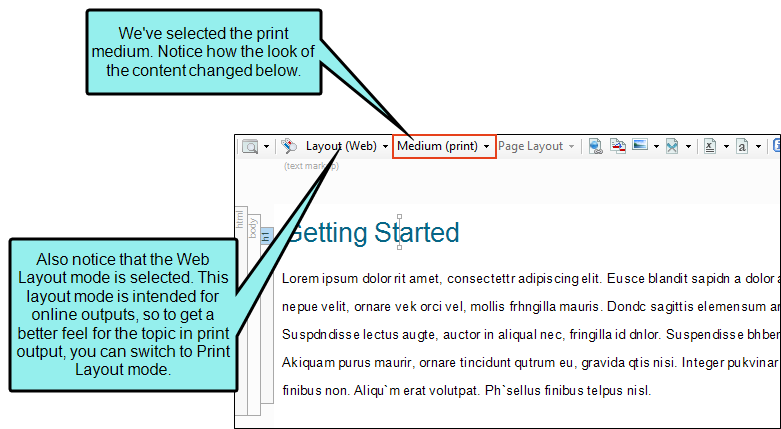 If you are using the Print Layout view in the XML Editor and the topic contains more than one page of content, a label appears beside the scroll bar indicating the current page.